BUDDING young creatives from across Reading gathered together to celebrate their achievements at an awards ceremony last week. Reading’s Cultural Education Partnership (CEP) hosted the first annual Young People’s Reading Arts Award Celebration at South Street Arts Centre, on Wednesday 6th February from 4.30 to 7pm. Over 100 parents, carers, teachers, young people and cultural partnership members attended the event for an enjoyable evening of awards, talks, performances and art activities. The event celebrated young people who had achieved an Arts Award qualification in Reading during 2018. One of the groups who received awards during the evening also performed their dance routine on the night. 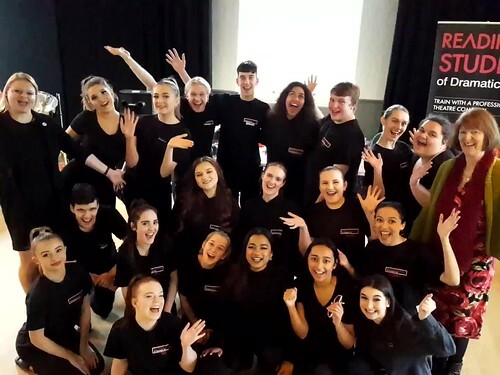 As part of Reading’s Cultural Education Partnership, Reading Rep Theatre worked with 57 students at Reading College to help them gain Bronze and Silver Arts Awards. This saw the participants take ownership of their own artistic practice, learn more about artists who inspire them and also gave them experience of delivering workshops in local primary schools. One participant said that taking part in Arts Award really boosted her confidence, especially as she was given the responsibility to represent a professional theatre company through delivering workshops to promote Reading Rep’s Christmas show. Cllr Sarah Hacker, Reading’s Lead Member for Culture, Heritage and Recreation, and the Chair of Reading’s Cultural Education Partnership, said: “The Reading Cultural Education Partnership believes that these young people should be rewarded for their tremendous efforts in gaining a nationally recognised qualification in the arts. I’m delighted we have been able to celebrate these achievements at this great event and I hope this will become an annual event in Reading’s cultural calendar. “Since the partnership started in January 2016, it has helped over 1,300 young people to gain an Arts Award accreditation. I would like to thank all our partner organisations who have been involved in this project and have helped drive its success. Group photo shows Reading College dance students with Cllr Sarah Hacker (R) and Dr Ruth Taylor, Strategic Manager, Artswork (L). Reading Cultural Education Partnership formed in January 2016 and is made up of representatives from several local organisations, including Reading Borough Council, Reading College and The University of Reading, as well as many representatives from the local arts community including Readipop, Jelly and Reading Rep. The CEP receives support and investment from Artswork, the South East Bridge organisation, supported by Arts Council England. Artswork acts as a source of inspiration and practical support for those engaging with children and young people, enhancing their expertise and building bridges between cultural and educational organisations to strengthen infrastructure, facilitate partnerships and sustain access to arts and culture. Reading is one of the flagship towns in the south-east involved in the Arts Council’s Cultural Education Challenge, alongside Brighton, East Kent, Milton Keynes, Hastings and Slough, of which Cultural Education Partnerships are an integral part. ← Cow Lane Bottleneck Removed!